Two years ago, after he kept experiencing severe eye pain that came on periodically and unexpectedly, Marc Ryan discovered he had an autoimmune disease called ankylosing spondylosis. Marc was in pain, exhausted all the time, and could barely get through the day. He was also diagnosed with the thyroid autoimmune disease called Hashimoto’s Thyroiditis. Out of necessity, he had to find ways to effectively manage his autoimmune diseases so that they did not ruin his life and so that he could continue to function. Marc set out on a journey to help himself and he won. Today Marc runs a busy practice in Los Angeles where he uses a mix of Eastern and Western medicine called functional medicine to help his clients with autoimmune disease. He is particularly passionate about helping fellow Hashimoto’s patients. Written by Marc Ryan, L.Ac. In today’s health care system there are many specialists. It is easy to lose track of the fact that the body is a group of ecosystems, all interconnected and interacting. It is not just a bunch of unrelated machine parts. 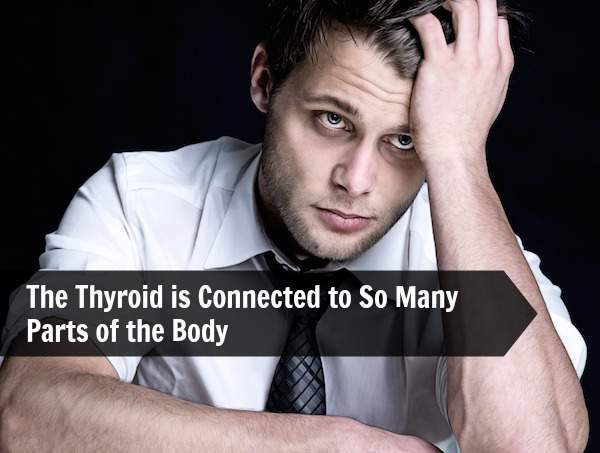 The thyroid is a perfect example of all these complex interactions and connections. When you have hypothyroidism and Hashimoto’s, chances are good that you have symptoms in some other areas of your body. Read on and you will understand why. That’s right, 11. In this blog post we will introduce each one of them briefly and also discuss how these connections affect Hashimoto’s patients. Adult hypothyroid and some Hashimoto’s patients tend to have higher than normal bone density. But, this higher density does not necessarily mean good bone quality: there may be issues with collagen, bone turnover, the size of mineral crystals and bone structure. So, even though the bones are more dense, these people may still be at risk for fractures because the bone quality is really poor. IL-6, an inflammatory cell commonly seen in Hashimoto’s patients can also lead to bone loss. Blood sugar is controlled by the pancreas. The pancreas and thyroid are both part of the endocrine system. The endocrine system is made of many feedback loops and their various hormones all “talk” to one another and make changes to the body to try and keep things in balance. These systems also work in both directions. They influence each other. In case of sugar, insulin is released by the pancreas to help the cells of the body absorb sugar so that it can be used. And the adrenals release cortisol to help sugar get absorbed by the cells of the body. A hypothyroid state leads to a slow absorption of glucose, a slower breakdown of insulin, a decrease of the speed at which glucose is absorbed in the gut, a lower glucose to insulin response and, finally, less glucose in the cells for the body to use. All of this means less energy to power your cells and brain and more fatigue. Every Hashimoto’s patient has some degree of the sugar imbalance described above. If you are skinny, it may be hypoglycemia. If you are overweight it may be insulin resistance or metabolic syndrome. If you feel better after you eat, you are hypoglycemic. If you are tired after you eat, you may have insulin resistance. All of this creates a vicious cycle that can really stop you from getting better. All Hashimoto’s patients must take blood sugar problems seriously. You won’t get better unless you do. The most common symptom of hypothyroidism and Hashimoto’s is fatigue. Thyroid hormones are very important for healthy brains. In the adult brain, thyroid hormones have shown the ability to help the brain grow and change and to help the brain age in a healthy way. Hashimoto’s patients know about “brain fog”. There are many reasons for this. The principle ones being inflammation of the brain and a breakdown of the blood brain barrier. The proteins that protect the brain (called zonulin) are the very same proteins that protect the gut. So if you have leaky gut, there is a good chance that you also have leaky brain. Brain fog is a brain cell activated immune response. The immune system in the brain is not specialized and sophisticated like the immune system in the rest of the body. Brain immune cells (called microglia) are kind of like paranoid chihuahuas with automatic rifles. They tend to over-react quickly and when they do you get lots of inflammation (brain fog). In some patients, thyroid hormone may improve brain fog. In others it won’t. You have to reduce inflammation in the brain in a different way. One important herb that is used is turmeric. In hypothyroid conditions, both the breakdown and the use of cholesterol by the body are depressed. But the breakdown is much slower, so the net result is higher cholesterol, triglycerides and LDL. This may be slower because of a decrease in the breakdown of fats once they leave the liver or in a decline of LDL receptors. Studies also report an increase in the number of gallstones and stones in the common bile duct. One reason they think this might be happening is because the thyroid hormone thyroxine relaxes the gall badder’s opening (called the sphincter of Oddi). This makes bile not flow normally, and makes the possibility of stones forming in the bile duct more likely. Thyroid hormones have a big impact on many functions of the arteries and veins in the body. Low T3 levels are frequently associated with cardiovascular diseases. One of the most common problems that Hashimoto’s patients have is cold hands and feet. Hair loss can also be caused by poor blood flow. Fungal nail growth is also a sign of poor blood flow. Low thyroid function means less nitric oxide is available in the blood vessels, this can lead to a break down of the vessels themselves and add in the problems with cholesterol and you have a recipe for plaque in the arteries. For those patients taking thyroid hormone replacement medication, some of these problems have been reversed by the medication. Thyroid hormone has a direct effect on movement through the entire gastrointestinal tract. Thyroid hormones increase intestinal neurotransmitters, increase blood flow to the intestines and support the repair and regeneration of the intestines. 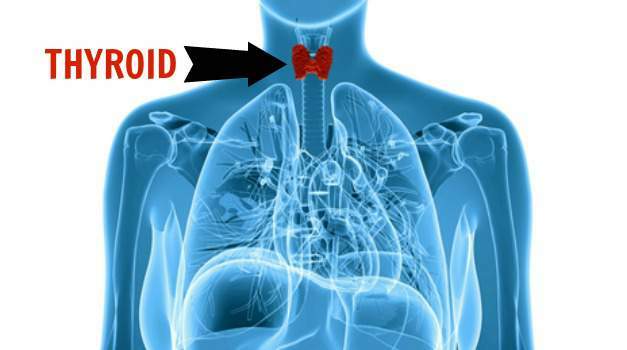 Hypothyroidism can slow movement through the esophagus, can affect muscle function in this area and can affect the nerves that cause movement. Hypothyroidism also has an effect on the vagus nerve and this can lead both directly and indirectly to slowing movement through the intestines. In fact, the same neuro-degeneration that takes place in the brain can also take place in the enteric nervous system of the gut (what some people refer to as the body’s “second brain”). Constipation: One of the most common complaints of Hashimoto’s and hypothyroid patients is constipation. When the bowels slow and it takes more time to empty. Malabsorption: People with hypothyroid problems and Hashimoto’s can have difficulty absorbing important vitamins, minerals and nutrients from their foods. This can also lead to a host of health problems including low protein, anemias, and vitamin deficiencies. Hyperthyroid patients can experience diarrhea that can also lead to poor absorption. Dysbiosis: Hashimoto’s and hypothyroid people often have issues involving problems in the intestinal tract with overgrowth of yeast, harmful species of bacteria and fungus. When you add the problems caused by gluten and cross reactivity to the slowing of movement and repair in the intestines you have a recipe for a really vicious cycle. Gluten causes breakdown of the lining, slow transit and slower repair means that damage done is compounded and each makes the other worse. T4 that is secreted by the thyroid gland is converted by the liver into T3 which then has effects on the body. Patients with liver diseases, like cirrhosis have problems converting T4 into T3. High TSH has also been found to cause an abnormal response in the pituitary gland, which signals the thyroid to release more hormones. Hypothyroid and Hashimoto’s patients also experience issues involving the liver. A hypothyroid state can lead to problems with detoxification pathways, especially phase II detoxification. This can lead to a clogged liver and more problems with converting T4 to T3. This is the reason why liver detoxification is so important for Hashimoto’s patients whether or not they are taking thyroid hormones. Many Hashimoto’s patients have issues maintaining a proper weight. For some it is due to a low thyroid state, for others it is due to a hyperthyroid status. For those who are unable to lose weight, there are several different reasons for this. Thyroid hormones are responsible for metabolic activity, a slower metabolism means an inability to lose weight or, in some cases, weight gain. A hypothyroid state can also slow the the body’s ability to use free fatty acids, when this happens fat can not be broken down. A slower metabolism and fat not breaking down can both lead to fatigue. Hypothyroidism can also cause less growth hormone to be produced, this can lead to loss of muscle mass and the inability to build muscles. For Hashimoto’s people who have difficulty gaining weight, their problem is that their thyroid is undergoing an immune attack and is in hyperthyroid state. This can last for an extended period of time. Eventually, in Hashimoto’s patients, they get to a hypothyroid state due to thyroid tissue destruction. If a patient stays in a hyperthyroid state, then Grave’s disease should be considered. When someone is hypothyroid, serum protein levels may be increased because capillaries dilate and allow larger proteins into the bloodstream. Albumin also breaks down more slowly. This can be seen in elevated protein in both the blood and the urine. Macrocytic anemia: Low thyroid activity can lead to this because of a decrease in absorption of vitamin B12 and folic acid caused by a decrease in hydrochloric acid. For this, one must rule out the autoimmune condition below and if it is not autoimmune supplement with B12, folic acid and possibly hydrochloric acid. Pernicious anemia: This is an autoimmune disease caused by an autoimmune attack on intrinsic factor which is responsible for helping the body absorb vitamin B12. One of the realities of autoimmune disease is that there are sometimes multiple tissues being attacked. In about 12% of Hashimoto’s patients, there is also an autoimmune attack on intrinsic factor. If you suspect this type of anemia, an Intrinsic Factor Autoantibody test can be ordered. (IF ab). If this is positive, then they have pernicious anemia. These people respond better to B12 injections. Iron deficiency anemia: Hypothyroidism can also affect iron absorption because of decreases in stomach acid and excessive blood loss from progesterone receptor site resistance. If iron is deficient, TIBC (total iron binding capacity) should be checked. This will be elevated in iron deficiency and is a good marker to see early iron deficiency. For this, supplement with iron, hydrochloric acid and possibly vitamin C to enhance absorption. And here is why this matters: if a patient is anemic, they are not getting enough oxygen to their cells and nothing you do is going to be effective. If you don’t fix this, all the treatments that you attempt will be exercises in futility because the cells of the body are not being powered properly. All those symptoms that you experience are not by accident or some coincidence. There are very clear reasons why your body is experiencing what it is going through. When you understand these connections and understand what to look for and what you can do about it, you can have a much better quality of life because you have the proper tools to manage your condition. There’s a big difference between lazy and tired all the time. If you’re like many of the people I’ve worked with you may feel like other people think you’re lazy, when, the truth is, you’re just plain tired. Marc Ryan is a graduate of Cornell University, a Licensed Acupuncturist in the State of California, a Diplomat of Chinese Herbology, NCCAOM, a Diplomat of Acupuncture Orthopedics, NBAO, and the founder of Hashimoto’s Healing. His book How to Heal Hashimoto’s: An Integrative Road Map to Remission is the first book of its kind to incorporate the ancient healing practices of Traditional Chinese Medicine to heal autoimmune thyroid disease. I had gallbladder removed and then thyroid due to cancerous nodule. On synthroid 88mcg. I’ve gained 30 pounds, have no motivation, read lots on websites but don’t know who to believe. My levels are “normal” according to dr. Started gluten free diet – no change and very frustrated. Can supplements help? If so which ones?ive heard probiotics, bcomplex, d3/k2. A to name a few. I’ve just want to feel normal again. Please help . I stumbled across this as I was looking for more info on my hypothyroidism. I didn’t understand the whole body connection. I have problems with my gallbladder. This article opened my eyes to more than my PCP or gastroenterologist every told me. My PCP is treating me with levothyroxine, however I want more information than I was originally given by him. Knowledge is power. Thanks again for this article.